As part of the project, researchers successfully developed a unique method of collecting and quantifying header and environmental loss, which could be implemented in various future research projects. and strategies for straight cutting canola. 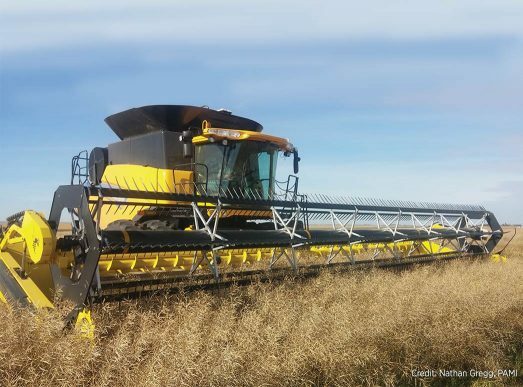 Visit the Resource Library online at saskcanola.com/resource to view the Guidebook for Straight Cutting Canola. 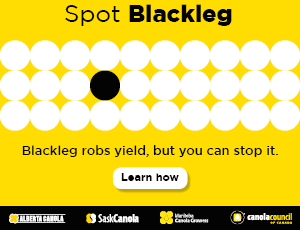 Hosted or sponsored by SaskCanola. The Canadian Western Agribition Grain Expo is a two-day speaker conference and trade show aimed at grain producers and their related industry. Learn more about degrading factors in wheat, barley and canola. SaskCanola’s AGM will be held prior to the start of CropSphere at TCU Place. 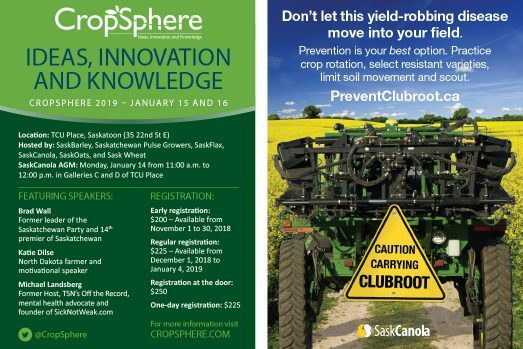 Canola producers may attend the AGM without registering for CropSphere. Ideas, Innovation and Knowledge. The CropSphere conference features sessions on market outlook, research and agronomy, along with sessions specific to each crop. Canola Council of Canada and SaskCanola will be exhibiting together in Hall B at Prairieland Park. A day of agronomy, marketing and management information. The canola agronomy event of the summer. 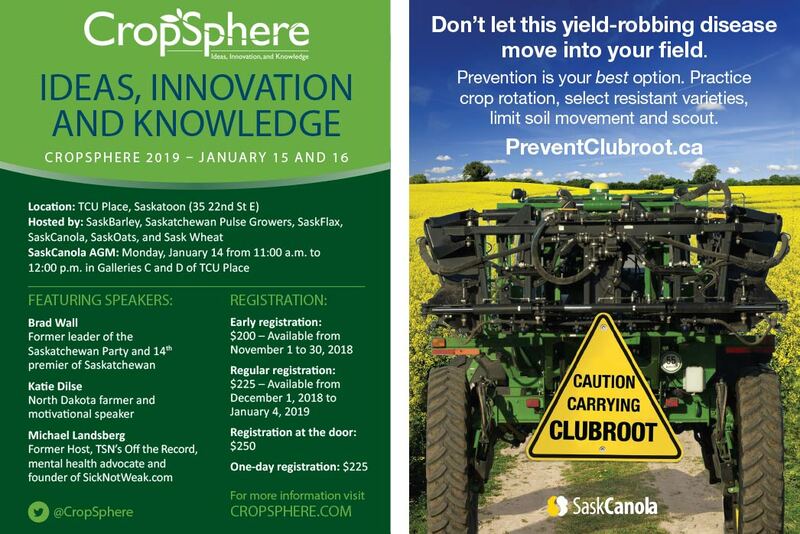 Visit saskcanola.com for event registration information. 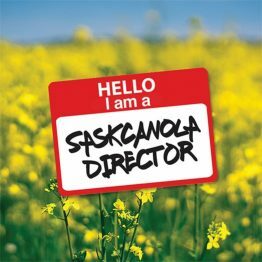 Follow @SaskCanola on Facebook and Twitter to receive important news and event updates! SaskCanola is governed by farmers so make sure your voice is heard and vote! 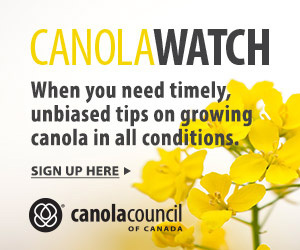 Five nominations have been received to fill four seats at SaskCanola’s board table. The five nominees include Charlene Bradley from Stranraer, Katelyn Duncan from Regina, Bernie McClean from Glaslyn, Beverley Shewchuk from Wishart, and Lane Stockbrugger from Englefeld. Profiles for each candidate are viewable online at saskcanola.com/about/elections.php. All registered producers* of Saskatchewan-grown canola are eligible to vote in SaskCanola’s board election and should have received a voter package in early November that included a unique voter number. Visit canolavote.com to use your unique voter number to cast your vote before November 30, 2018. There is an option listed in the voter package for registered producers who prefer to vote by way of paper ballot. The results of the election will be announced mid-December and at SaskCanola’s Annual General Meeting on January 14, 2019, held in conjunction with the CropSphere conference. *A registered producer is any producer who has sold canola in either of the previous two crop years and has not requested a levy refund in the past year.